7am alarms meant a relative lay in as we headed the 50km to Mandalay Airport for a 10am flight to Yangon. The old airport on the edge of the city was closed a decade ago a replaced by a ‘white elephant’ terminal an hour out of town – a further opportunity to take in views of the countryside and stupas. Our run of luck with bags continued – no hanging around and back in the car with Ang and a new driver for our day out in Yangon, before a midnight flight to China. Our first decision was itinerary – we’d packed so much into our first day in Myanmar that there wasn’t much of a formal itinerary left. This worked great with us as we wanted to revisit some of the sights that we’d breezed past earlier in the week and to try and get some flying time in with the drone. Ang threw in a last minute suggestion that we visit the British and Commonwealth Taukkyan War Cemetery on the outskirts of Yangon. We had no hesitation in wanting to visit – Burma and the Second World War having always been a passion of Mike’s. The cemetery, run and maintained by the British War Graves Commission is a beautiful and sobering tribute to the brave men and women of so many nations who gave their lives in the 1939-1945 conflict. 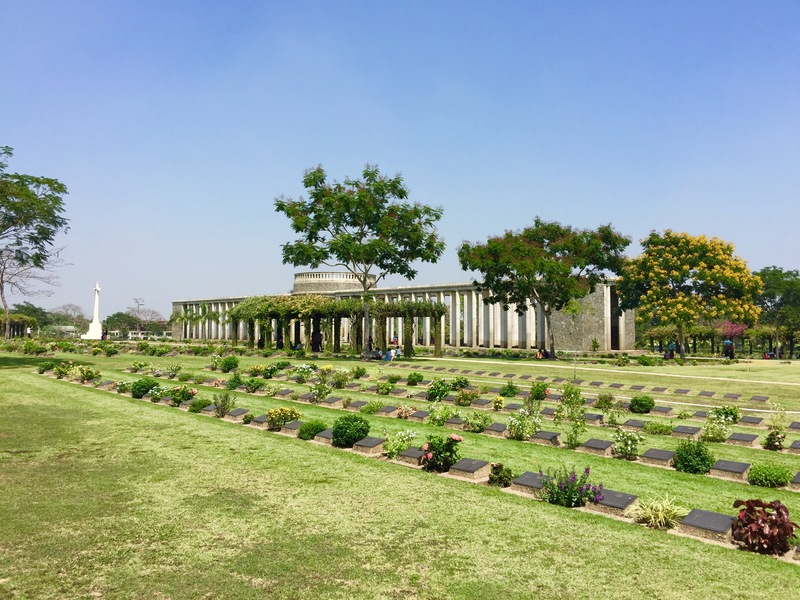 The rows of immaculately maintained graves, many bearing the simple inscription ‘An unknown soldier of the war’ were contrasted by the hundreds of local young Burmese couples who sat quietly in romantic embrace throughout the cemetery. Whilst at first this seemed odd, maybe even offensive but on reflection it may be the most poignant tributes – that freedom and love can blossom because of the sacrifices of so many brace young people seventy years ago. We made an effort to walk all four corners of the cemetery before paying our final respects and departing – a beautiful tribute and setting. We returned into town via a number of pagodas – including one housing a 70 tonne marble Buddha, before visiting the revered ‘white’ elephants. Unfortunately the poor albino elephants are left shackled under a roof eating branches and bamboo all day – shackled as children often throw things at them. My advice would be to chain the children to a concrete floor instead! Next stop was the a park near to the Shwedagon Pagoda – the most famous in Myanmar. From the park we got some good fly time and photos of the city, although the Pagoda itself is protected by anti drone defences so we couldn’t get directly overhead. From the Park we headed back into the city centre to the Secretariat building where Gen Ang was assassinated – a spectacular old colonial building which is now closed after falling into total disrepair. The building takes up a whole square block, and provides a great 30min walk and photos from all sides. 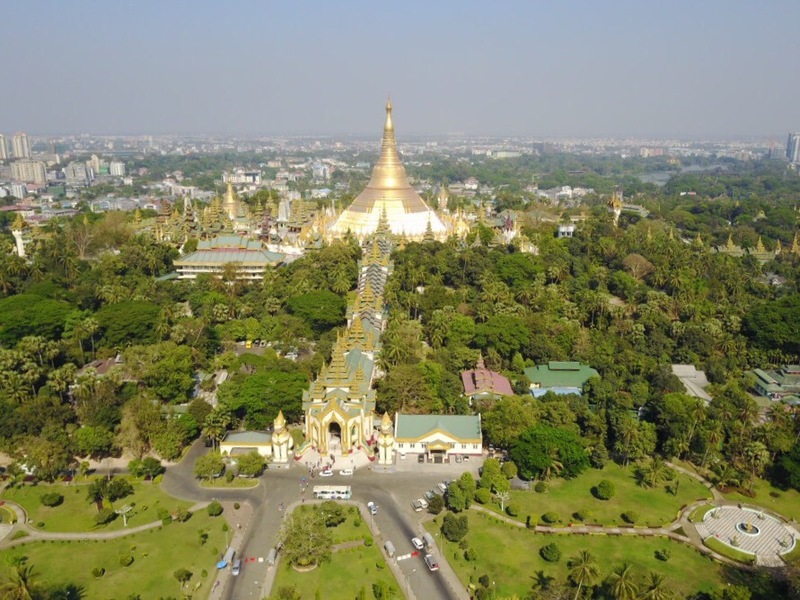 Having seen much of Yangon city from the ground, it was time to get some more fly time so we headed to the Independence Park – the difference this time being that the park was hosting a global photography exhibition and had hundreds of visitors. This may have acted in our favour as no one batted an eyelid at the drone – clearly taking photos of a photography exhibition is a great cover story! 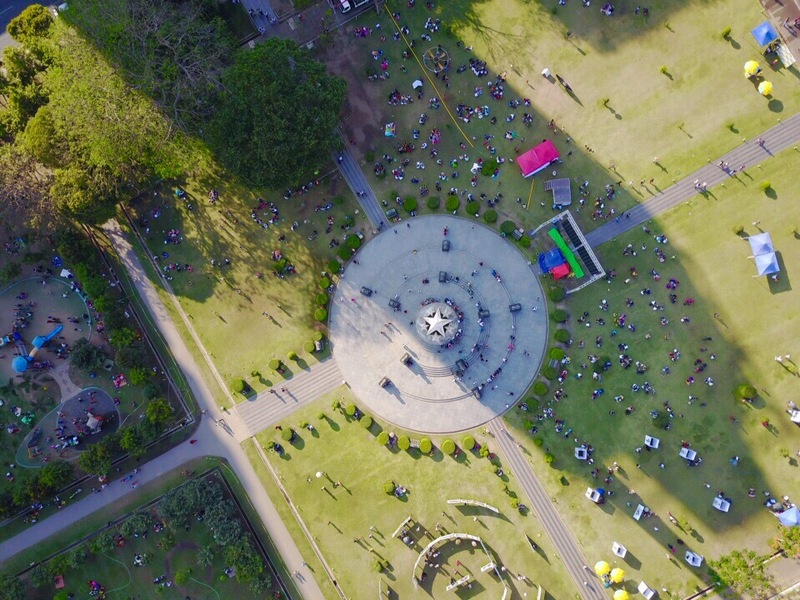 We captured some great views of the park and surrounding buildings, and most impressively the Memorial Monument which is in the shape of a star from directly above. Drone packed away, it was time for our final stop – the iconic Shwedagon Pagoda, the most famous in Myanmar. Whilst various temples have existed on the site for 2600 years, the current pagoda was constructed in the 14th century to house eight hairs from the Buddha. 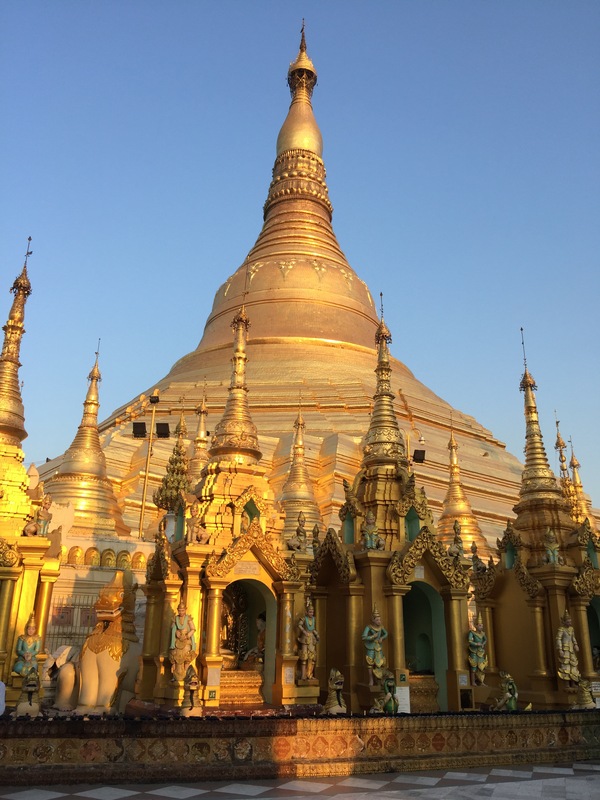 The spectacular stairwells and golden stupa provided and excellent opportunity for photos – especially as the sun began to set on our final afternoon in Yangon. Having had a day on our feet it was time to head to the airport for an urgent repack of bags and change of costume as we headed from the 37c heat of Yangon to the -2c chill of Beijing.